The NASA Earth Observing System is a $7.3 billion program planning satellite-based earth monitoring for 15 years, and is the heart of global change science for the United States. The central sensor on board the Terra Satellite Platform is the Moderate Resolution Imaging Spectroradiometer (MODIS picture). Terra was successfully launched on December 16, 1999, and a second MODIS-based satellite, Aqua, was launched May 4, 2002. The University of Montana is the only Forestry School in the country with a member on the EOS science team. 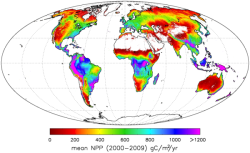 Our responsibility is to provide computer programs to use this new satellite data to calculate global photosynthesis and evapotranspiration for all terrestrial biomes. We envision the EOS satellite to provide a dramatic improvement in our ability to accurately monitor global ecological conditions. Large scale climate shifts, deforestation, desertification, pollution damage, crop conditions, glacial retreats, flooding, wildfires and urbanization are examples of the types of earth system monitoring planned. Currently, as we work on these software products, we are using Montana as a testbed for this advanced satellite technology. MOD15 Fractional Photosynthetically Active Radiation (FPAR) and Leaf Area Index (LAI) algorithm. This Level 4 product will be retrieved at 500m spatial resolution and composited to 1 KM on a 8 day basis. LAI defines an important structural property of a plant canopy which is the equivalent layers of leaves relative to a unit ground area. FPAR measures the proportion of available radiation in the photosynthetically active wavelengths (0.4 to 0.7 micro meters) that a canopy absorbs. MOD16 This MODIS evapotranspiration (ET) algorithm is based on the Penman-Monteith (P-M) equation. We incorporated surface stomatal resistance and vegetation information derived from MODIS land products to estimate daily ET and potential ET (PET) which is then composited over an 8-day interval. ET/PET ratio represents not only the "dryness" of the land surface but also the characteristics of the land surface in terms of energy partitioning, which has a large influence on the local and regional climate and environment. Evapotranspiration algorithm. This Level 4 product will be retrieved at 1000m spatial resolution and composited to 1 KM on a 8 day basis. In this product, evapotranspiration is described as a fractional value called "Evaporation fraction (EF)," which is a fraction of latent heat energy to available energy. This value represents not only the "dryness" of the land surface but also the characteristics of the land surface in terms of energy partitioning, which has a large influence on the local and regional climate and environment. MGDI Following the occurrence of a major disturbance, there will be a reduction in Enhanced Vegetation Index (EVI) because of vegetation damage; in contrast, Land Surface Temperature (LST) will increase because more absorbed solar radiation will be converted into sensible heat as a result of the reduction in evapotranspiration from less vegetation density. MGDI takes advantage of the contrast changes in EVI and LST following disturbance to enhance the signal to effectively detect the location and intensity of disturbances. MODIS Global Terrestrial Drought Severity Index As part of the MODIS global terrestrial evapotranspiration project, the goal of the Drought Severity Index (DSI) is to use satellite remote sensing data to monitor and detect drought on Earth’s land surface. The DSI enhances near-real-time drought monitoring capabilities that can assist decision makers in regional drought assessment and mitigation efforts, but without many of the constraints of more traditional drought monitoring methods.